Should You or Shouldn’t You Have a Gift Closet?? 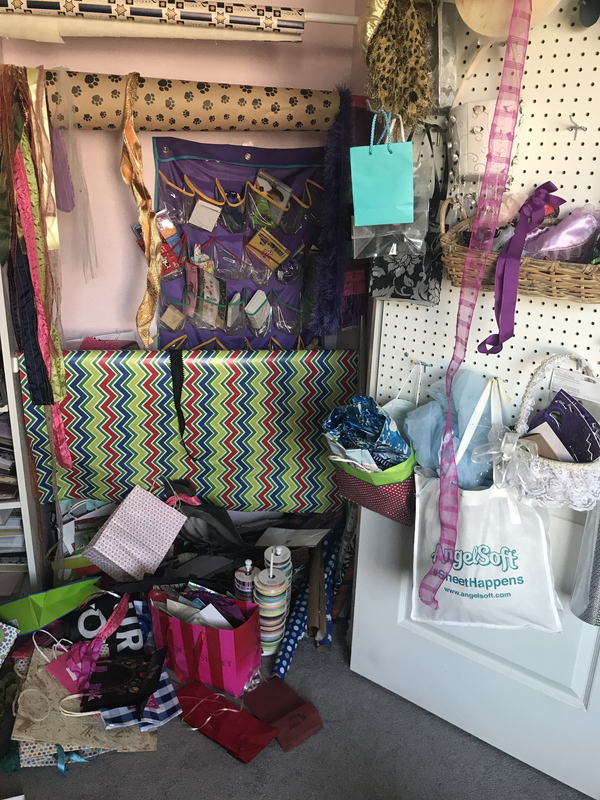 A Gift Closet is simply a closet completely dedicated to storing gifts that are purchased in advance — and in my case, all the accouterments to wrap said gifts — like bags, boxes, paper, tissue, ribbon, cards, etc. Saves Money! — You’ll see items on sale and think, “Wow! This is the perfect thing for So & So. But So & So (an unfortunate parental naming issue!) doesn’t have a birthday coming up any time soon, so you’ll buy it ON SALE and stash it away for when the occasion arises. You also may buy five more of them because if So & So would like it, chances are others would as well. Saves Time! — You can see why, right? When you need a gift for an upcoming party or occasion, is it quicker to drive all the way to the store or just walk into your Gift Closet?? Convenient! — All the stuff for the activity of gift-giving is in one handy dandy place — a closet! No running around for scissors, tape, or the gift itself. Helps Others! — Your family members (and close friends) will always know that if they’re in a dilemma, (they forgot to buy a present for tonight!) that your gift closet will magically open the door (pun intended) for them to attend a party stress-free. Deception! 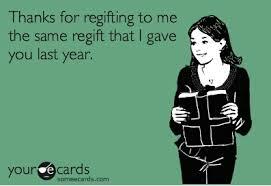 — Can the recipient of your gift return it and pick out something else they’d like better? Uh…. for the answer to that question let’s listen to how I lost a friend below. Friend: This was so very sweet of you, Stephanie. But looking at it, I think it’s gonna be too big on me. I’m such a petite, tiny, itty-bitty, delicate thing. So where did you purchase the blouse? Me: Oh! Um….Let me just rack my brain for a sec. It’s on the tip of my tongue. It’s a quaint little place, actually. It’s called (thinking quickly) “The Gifted Closet!” (Note: Other options I thought of were “The Present Arena” and “The Stashaway Zone” but I didn’t think those would go over quite as well. Friend: What a cute name for a Gift Shop. What street is it on? Me: (Feeling grateful there’s such a thing as the internet) It’s actually an online store but darn it, this was the very last top. I’ll just order you up something else instead! How about a bracelet? Friend: The Gifted Closet! I can’t wait to see what else they might have in my size. I’ll google it right now. Me: Uh…okay. Confession time. You’re gonna think this is just so funny. The Gifted Closet is really a closet right here in my home. It’s a very smart closet. Friend: Oh. Really. Wow. You just opened your closet and gave me one of your own old blouses for my birthday?? Me: No, of course not. Wait. Come back! It was new! It. Was. Brand. Spanking. New. I promise. Hold on please, before you storm off. Don’t you know about buying presents ahead of time? That’s an actual thing nowadays. Wait! Don’t open that door. Uh, that’s not the way out of my house, my friend. That’s actually … The Gifted Closet! Memory Loss! — That’s right. Trust me on this. You will never recall that you already bought a gift for your mother-in-law during the after Christmas sales and you will buy yet another one for her in your panic at realizing that Mother’s Day is tomorrow. (Note: She will dislike both of ’em.) You may even purchase something you already have eight of because you don’t remember the actual contents of your Gift Closet. 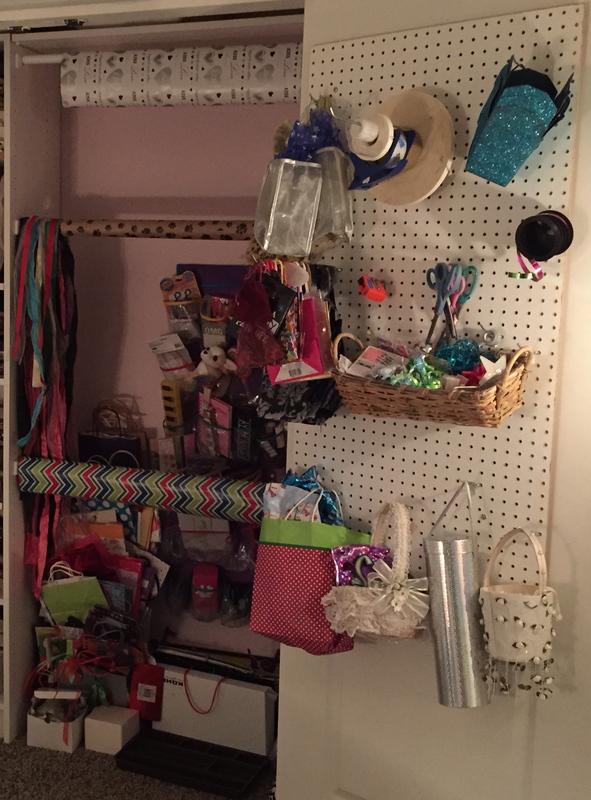 Heck, you may even completely forget you even have a Gift Closet in your house entirely! Or where you live. Over-Spending! — Everywhere you go, you’ll keep your eyes open for cute, inexpensive things to round out your Gift Closet. Turtle-shaped staplers in the clearance section of the office supply store? Absolutely! You’ll need a dozen for the next work party. Of course you will. Just know that these ridiculous items will end up in your front yard in a box marked “Free” when you’re trying to sell your house and you need to get rid of all its contents. So just face it, you’re actually shopping right now for your future Garage Sale! Space! — Do you really have a spare closet to devote to this nonsense?? Who are we kidding here? Now your umbrellas, brooms, coats, vacuum, extra wardrobe (for when you gain ten pounds) plus the dog’s leash has to be stored in the garage. Time-Consuming! — This is related to the above bullet-point on showing off. You’ll waste hours photographing this Gift Closet and putting pics up on Pinterest and Instagram. 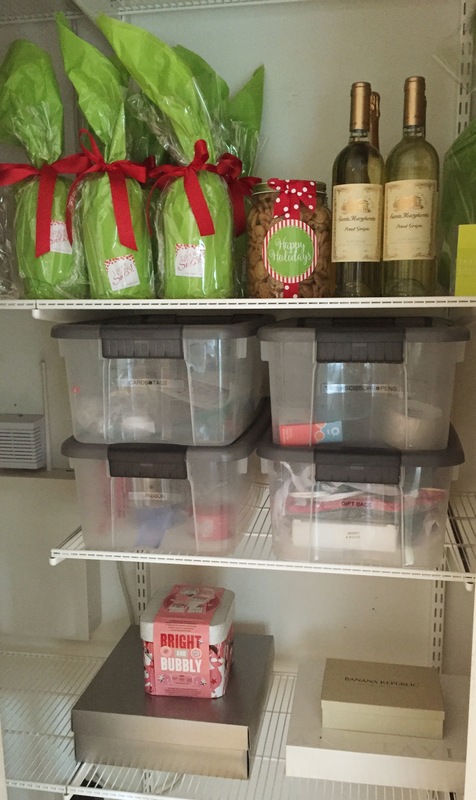 Because nothing says, “I’m totally creative and you’re not!” like a well-stocked Gift Closet. Embarrassing! — After all that bragging and boasting and showing off, you’re not going to be able to find a damn thing in your Gift Closet. It will become the messiest and most disorganized niche in your entire house. Guaranteed. It will make the Kitchen Junk Drawer seem neat as a pin in comparison. You will NEVER locate the bow that you saved from your wedding present with the miniature bride and groom nestled in the ribbon. (Yes there IS such a thing!) Don’t believe how fast it will become a pig sty? Have a look at my Gift Closet’s appearance at the very beginning of its inception. And then below you will see what it looks like now, just a mere TWO DAYS after I got it all clever and useful! (Honest engine. (And I even have one of these in my Gift Closet for all my train-loving friends!) This was a mere two days later. So what’s it gonna be folks? Scrap the gift closet and turn it into a Wine Cellar? Or recall the moral of the story in The Gift of the Magi and instead of buying lots of presents for non-existent holidays that you need to keep wrapping – just open your mouth and start RAPPING! JUST CLICK HERE! !